No job is over this little guy’s head. With those bold words, the R2 unit moved from risky design concept to record-breaking phenomenon, dominating the small-droid market like a bantha at an Ewok picnic. Everyone, it seemed, wanted an R2, and for a time Industrial Automaton could do no wrong. As MechTech Illustrated put it, the new product was “one of the most versatile, multitalented droids we’ve ever seen. The R2 unit can do it al.” Like its forerunners, the R2 was designed to work in and around space vessels as a diagnostic and repair unit. But unlike the clunky P2 and R1, this waist-high droid fit perfectly into the standard astromech socket of a military starfighter. This was a radical move, previously all such droids had been dedicated government models. The R2 quickly became as popular with Old Republic fighter jocks as it was with the public at large. When plugged into the rear of a Y-Wing or X-Wing, an R2 unit monitors flight performance, pinpoints and fixes technical problems, and boosts power from the shipboard systems. It can store up to ten sets of hyperspace coordinates in active memory, and many have the intelligence to perform engine startup and pre-flight taxiing. Each R2 operates flawlessly in the vacuum of interstellar space. 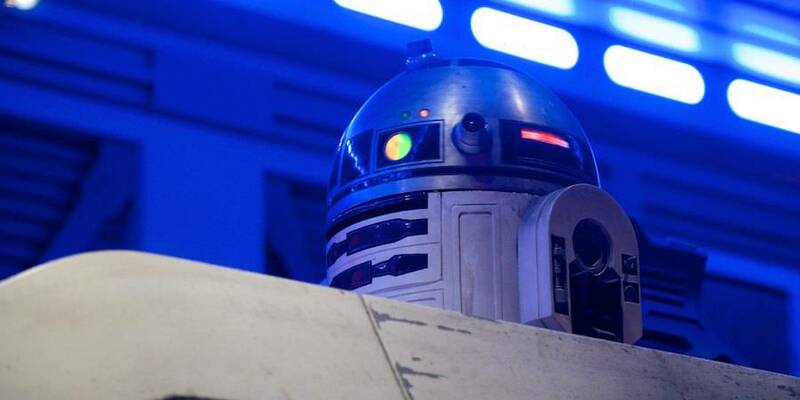 The R2’s personality is obliging, quick-witted, and sincere. If the droids go too long without memory wipes they sometimes develop headstrong self-reliant streaks, but many owners actually prefer to have companions willing to offer candid second opinions. R2-D2 (also R2 for short; pronounced Artoo-Detoo or Artoo) is a long time counterpart of Protocol droid C-3PO. Along with his resourcefulness, R2 has many tool-tipped appendages that allow him to be a great starship mechanic and computer interface specialist. A bold droid, R2 often enters dangerous situations without second thought. This adventurous streak has saved the day on numerous occasions, often turning the tide of galactic history. His story is a long one, and includes many heroic actions, such as the rescue of Queen Amidala’s starship during the blockade of Naboo, and his actions during many battles in the Clone Wars and the Galactic Civil Wars as the copilot of both Anakin Skywalker and his son, Luke Skywalker. 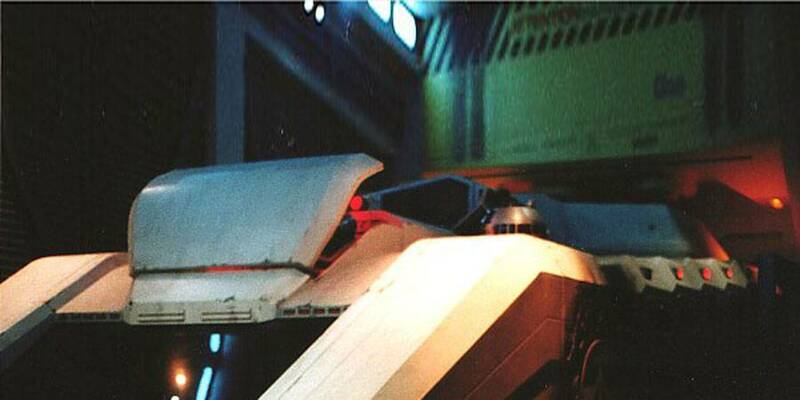 R2-D2 is now at Star Tours working once more alongside C-3PO. 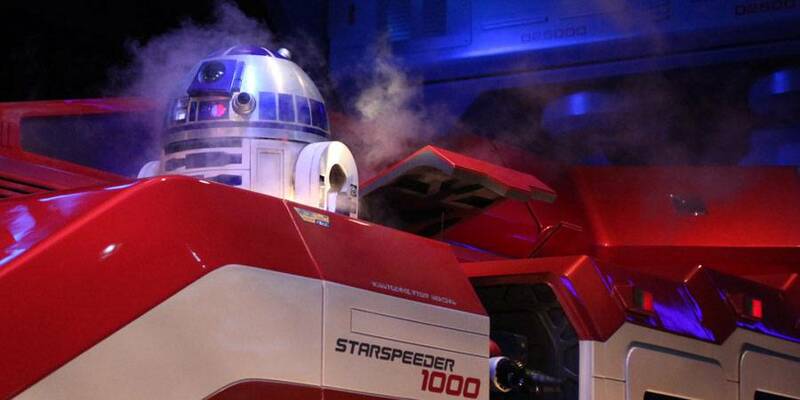 As an Astromech, one of the many talents of R2-D2, is piloting the Starspeeder 3000. R2-D2 also pilots the Starspeeder 1000. 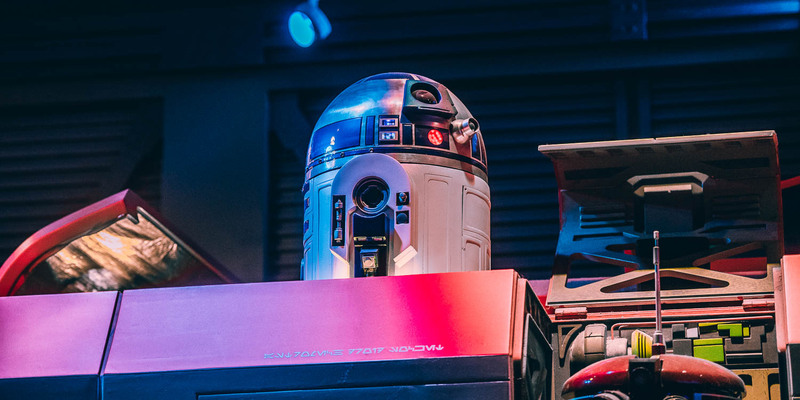 The R2-D2 used in the Anaheim queue is one of the screen-used R2-D2 models used in the making of the original Star Wars trilogy.